We strive to make our Order Process as simple as it can be! Custom Screen-Printing can have many details and considerations, so we’ve compiled this resource of common questions to help break down the Order Process. Need help? Contact us! We can’t wait to talk about your project. This FAQ is a continuous work-in-progress. If there’s a question you think should be here, let us know! Your feedback is hugely appreciated. At Floodway, we’ve made Customer Service and Print Quality our top priority. Check out some Google Reviews to see what our awesome customers have to say. Every order is important to us, down to each single print. Our goal is to provide a top quality product at an affordable price, with attentive personalized service each step of the way. For a basic order with no add-on services, the standard turnaround time is 10 business days, but typically a few days quicker. This countdown starts from the day we have your order fully approved and your deposit processed, so remember to budget time to bring your details together. A ‘business day’ is considered every working day of the week, and does not include weekends or Public Holidays. The cutoff time for a business day is 3PM Central. Some services and printing methods (like custom care labels, woven label sewing, specialty print locations, etc.) add to the standard turnaround time. Turnaround time does not include the pickup date or shipping time. For example, if you need to pick up (or have your order shipped) on a Friday, your deadline is Thursday. If you have a strict deadline, please notify your Account Executive during your order process. Rush Orders are subject to availability. Availability of Rush Services are on a first come, first serve basis and availability can not be guaranteed. Orders needing a quicker turnaround time than what our standard turnaround offers can take advantage of Rush Services. This service schedules your order ahead of booked orders and guarantees the date, so it is only fair that a fee applies for this priority. Rush Service charges cover expedited processing, extra production & booking logistics, express shipping, and adjustments to our print schedule to accommodate the deadline. Charges vary based on the complexity and logistics of the project. The availability of your Blank Garment is one of the biggest hurdles of a Rush Order. We’ve prepared a selection of Rush Ready Garments to help narrow down your search for quality items that are readily available for Rush Services. Choosing a garment outside of the Rush Ready category may incur additional express shipping charges, or face issues with stock availability. Note: Rush Orders do not have guaranteed quantities! The tight deadline does not allow for additional pieces to be ordered and printed in case of print or garment defects. We highly recommend ordering extras of each size to avoid the possibility of the aforementioned issues on your Rush Order if a specific quantity is required. Can I submit an order by phone? Or only by email? – Phone calls demand immediate responses, which aren’t always the best responses. Email lets our team take a moment to gather the necessary information and consider all of your detail before drafting a response. We’re a small team too, so it can often be tough to get on the phone when the press is spinnin’. – You can’t go back and review a phone call. Each order has its own unique set of variables between the garment, sizes, colours, designs, and print process. It saves a ton of time (and potential headaches!) to have a written reference. Email threads are best for exchanging detailed information so that we can nail the expectations for your order. Unfortunately we cannot book any orders by phone at this time. Please contact us by email. How does pricing work? Can I get a quote? Your total price per piece is based on your print cost, plus the blank price of your garment. Our pricing is totally transparent – no need to wait for a quote! You can easily check or compare prices before starting your Order. Our website shows all print costs and a wide variety of blank garment options with wholesale prices. Custom Screenprinting Pricing based on the total number of colours in your design, and the total quantity per design to be printed. Each print location is priced individually. Our first price break is at 25+ pieces, and set-up charges ($25 per colour, per design) disappear at this quantity as well. Blank pricing can be found in the Products and Pricing section of our website. Each product page has a handy chart of screenprinting prices for various quantities to help determine your final price per piece. Need help figuring out your pricing before getting an Order started? Connect with our team and we can help break down the details! What file format should I send my designs in? A sharp, crisp print depends on your design file. A good file is the start to a great print, and your design files must be received before we can start the order process. An unflattened vector version of your logo or design (.ai / .eps / .pdf) is ideal. Raster files (.psd, .tif, .jpg) should be scaled to the size of your print, with a resolution of at least 300dpi for best results. Every system renders fonts differently, so please remember to outline your fonts! We have a quick guide on how to outline your fonts in Adobe Illustrator or Photoshop right here. Need a hand? Every order includes a bit of time to help bring your files up to scratch, just ask your Account Executive. We’re happy to connect with your designer to get the right files directly, as well. After you have approved your Order, we require at least 50% of your total to start work. The turnaround time for your Order begins once your approval and payment are processed. Invoices totalling less than $500 require a 100% payment. Rush Orders require a 100% payment. Unfortunately we can no longer accept credit card payments towards larger ($4000+) invoices. Our preferred method of payment is an Interac e-Transfer. Please include your invoice number on the transfer to expedite processing and remember to let your Account Executive know the password. We accept credit card payments as well, but only when paid in full. We can also accept a direct bank transfer. Ask your Account Executive for our deposit information. We also accept cash or cheque in our studio, by appointment. The remaining balance of your order is due before shipping or pick-up. Do you offer Custom Embroidery? We used to offer embroidery services by outsourcing to a local supplier. After some success we ultimately found it was a distraction from screen printing, and we have stopped offering embroidery outsourcing services. Floodway was founded after frustrations as customers in regards to both quality, and customer service. Both screen printing and automated sewing are individual crafts and our industry has a tendency to split its focus between both print and embroidery. With screen printing, we’ve known since day one that understanding the relationship between design, garment, and print process are key to a great final product. In turn, we’ve always dedicated our extra time and resources to improving the print process, testing new inks or garments, and mastering techniques. Specializing in screen printing in-house lends itself to a higher level of accountability, reliability, and efficiency. This allows us to offer screen printing confidently, to truly understand costs, and to package it into a trusted service for a wide range of clients. In our opinion, many compromises must be made when part of the process is being outsourced, or when a team’s focus is split between two distinct production lines. Passion in the process puts perfection in the work, so we’ve strengthened our commitment to screen printing by dropping embroidery outsourcing services. Every person on our team is focussed on understanding and improving the screen print process. What is the difference between Screen Printing, Digital Direct-to-Garment Printing, and Dye-Sublimation printing? Screen Printing is our specialty, but it is one of many options available. 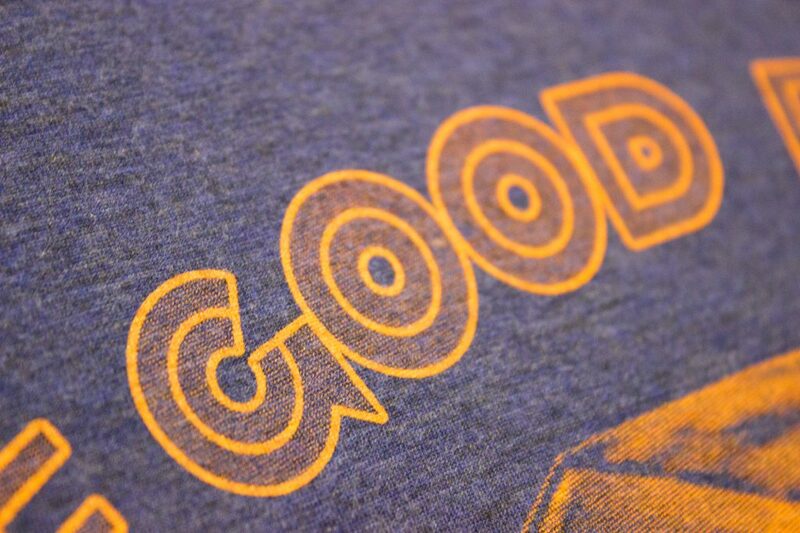 Each method has its own advantages, with Screen Printing being the most versatile. 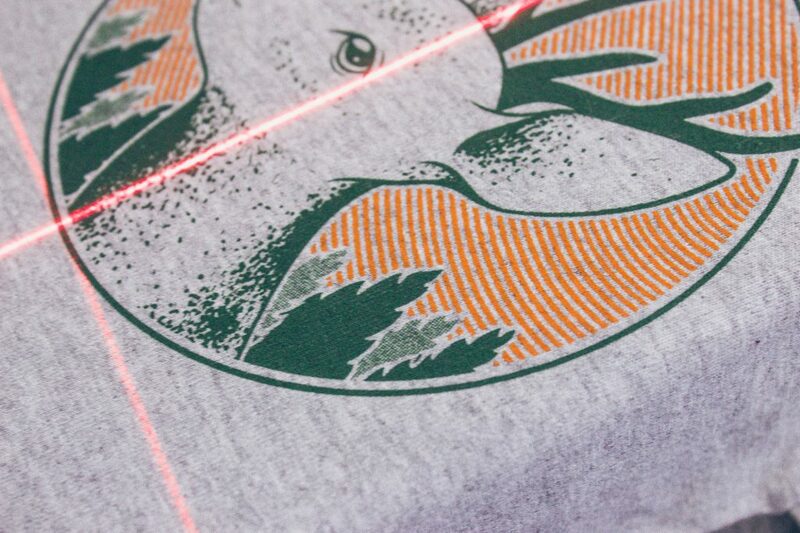 – Direct-to-Garment is a digital printer, that prints directly onto the fabric. Also known as ‘DTG’. Since it’s like a typical home printer, it can output multiple colours and photographs right onto a t-shirt. – Dye-Sublimation Printing is the process of printing onto a special heat-transfer paper, and transferring it onto the fabric with heat and pressure. Screen Printing is a versatile process and automatic presses are capable of producing hundreds of prints per hour. When you think you’ll need 12+ of the same design, then Screen Printing will be your best bet for quality, versatile garment choices, and economical pricing. Check out our blog post for a full rundown: Screen Printing vs. Direct-to-Garment and Dye Sublimation: What are the Pros & Cons? Still having trouble deciding? When our Screen Printing Services aren’t the best solution for your project we will always be happy to recommend a local shop that can meet your needs, when available. Get in touch today! Setup charges apply to orders of less than 25 pieces. Setup charges are based on the total number of colours in your print, and the total amount of print locations. The $25 Setup charge covers the costs of preparing your design for print, creating the screen for production, ordering the garments, and setting up the press for your print. For example, an order for three t-shirts with a two-colour print would have two Setup charges, one for each colour in the print. This charge is in addition to the cost per print, and the blank price of the garment. Remember, orders of more than 25 pieces (per design) are exempt from all Setup charges! What ink colours are available? We offer 40+ Stock Ink Colours for your project. We can also mix a custom colour using the Pantone system. Custom colours are $35 per custom colour, per order. Is there a discount for re-orders? Yes! You’ll receive discounted pricing for orders placed within thirty (30) days from the day your order is ready for pick-up. To be considered a ‘re-order’ the design specs, placements, and garment style/colour must be the same. The only allowable adjustment to re-orders is the quantity. Rush Orders and/or Contract Orders do not qualify for discounts. If your re-order quantity is in the same range or larger, we will apply a blanket discount of 10% off your invoice – to a max of $50. If your re-order quantity is smaller, we will apply the same quantity discount as your largest invoice. Re-orders of less than 25 pieces are subject to all applicable set-up fees. Example A – David orders 50 hoodies and they sold out! He only needs 12 more. The 12 additional hoodies would carry applicable set-up fees due to the low quantity – but each hoodie would qualify for the same 50 piece pricing. Example B – David orders 50 hoodies and they sold out! Now he needs 100 more. The 100 additional hoodies would qualify for the higher 100-piece price break, plus be discounted 10% up to $50. Is my design affected by seams or zippers? We don’t recommend printing over seams, or zippers. We do our very best to produce the best looking prints anytime we pull a squeegee. However, printing on or over any seams, collars, pockets, zippers or otherwise is subject to distortion, print imperfections, and/or other small inconsistencies. The closer a print is to a seam or zipper, the more prone to inconsistencies it will be. We typically recommend prints are placed no closer than 1cm to a seam for best results. What type of ink is used for screenprinting? We specialize in screenprinting plastisol inks only. We do not offer water-based or dye-discharge inks at this time. Each ink type has its unique benefits and limitations. Plastisol ink is easier for our small operation to work with, and yields bright and opaque prints. Waterbased and dye-discharge inks can achieve super soft prints, but typically not as bright or easier to work with for smaller runs. While plastisol inks cannot achieve as soft of a print, we specialize in striking a balance between a bright detailed print, and a soft comfortable-to-wear print. We are aiming to expand into a wider variety of ink types in 2018 as we move into our new studio, but these processes are typically held to a higher minimum than plastisol ink prints, making them less economical for smaller runs than plastisol inks. We only offer options that we can stand behind 100%. Does info on a Custom Care Label need to comply with any laws? Some retail environments are strict about labelling requirements. While we do offer templates, we can’t guarantee that a Custom Care Label will meet any specific label requirements. We always advise to include at least the garment material and the country of origin. A comprehensive Guide to the Textile Labelling and Advertising Regulations is available for reference. What about Special Effects like Flock Transfer? Flocking is a process where an adhesive is printed onto the garment, and a fuzzy flock powder is applied to the print, leaving a textured satin-y feel. We do not offer this process at this time. At this time, flocking is suitable only for large quantities. In lower quantities we recommend a heat-transfer product, like Siser StripFlock. This has the same limitations on designs as regular vinyl. Smaller details can be touch to achieve, and designs are limited to a single colour. Ask your Account Executive for more details. How do Pantone matches work? Inks can be mixed to closely simulate swatches from the Pantone Matching System. We keep a copy of both the Solid Coated and Solid Uncoated guides in our studio. Once printed, the main type of inks we use are similar swatches from the Solid Coated book. The inks are slightly glossy and reflect a bit of light, so it’s not possible to simulate Solid Uncoated swatches with our current ink process. Both the Solid Coated and Solid Uncoated books contain inks printed onto paper. Screen printed inks applied to textiles behave a little bit differently due to difference in the ink and the texture of the garment, so it’s important to note that it’s not possible to perfectly match a Pantone Swatch, only to closely simulate it with the different ink type. There are optical differences due to the variables between ink and garment. Ask your Account Executive for more details when exact colour accuracy is a concern! Do you offer Special Effects like ‘Puff’, ‘Metallic’, ‘Glitter’, or ‘Clear’ ink? We sure do! Check out our Pantone Matching, Stock Ink, and Special Effects page and ask your Account Executive for more details. Can you create an original design for me? If you need an original design created from scratch, our in-house design team can help bring your vision to life, as well. Our in-house services start at $50/hr and you can view more of our design work right here. We can also connect you with established local designers if your concept falls outside of our in-house design specialities. Visit our Custom Graphic Design page or ask your Account Executive for more details. All original designs created by Floodway Print Company are the sole property of Floodway Print Company. If you hire us to create a design for you, you are strictly paying for the labour and thought process to produce the design. You are not paying for the ownership and rights of the design. Rights to the design can be purchased in addition to the creation fees. Any design you submit to us for printing, that is not being created by Floodway Print Company, is owned by you or its rightful owner, not Floodway Print Company. We will not reproduce your design, trademarked or not, without you or the rightful owner’s consent. Can you help get my design files ready for print? Need a little help getting your idea onto a t-shirt? Our highest priority is doing justice to your design or logo and make sure it looks the way you want once it’s printed. Every order includes some time to help get your files ready for print. As a free service, our team does its very best to fix pixelated artwork, to adjust and make suggestions for placements and centering, and to spot any opportunities to help optimize your design to the garment and print process. We want every print to looks the best, but adjustments exceeding 30 minutes are billed at our in-house design rate. We will always give you an estimate before doing this work, if it’s required. Can I see a design proof before I confirm my order? Absolutely! Creating mockups is part of the ordering process for every order. The mockup gives a visual idea of the size and placement of your design. Please note the digital mockup is created on a generic garment template. When printed, the design will appear larger/smaller on some shirts depending on the size of the garment being printed (example: Small vs. XL tees). Mockups are generally based on a garment in size Large. Due to variances in monitor calibration, colours on the mockups may appear different on your screen. Changes to the order after approving the mockup could increase turnaround times for your orders. We will not be responsible for errors, misspelling, or otherwise in approved designs and/or mockups. Due to the massive variance between brands, sizes, styles and other factors there is always a variance in the size of a design on a mockup in relation to the garment. Designs will always be printed to the size spec on the Order. If no custom size specifications are provided the design will be printed to our in-house standard specs for the placement. Distribution of mockups should credit Floodway Print Company. Can I order a mix of different colour garments, or different style garments? We have a $10 flat-rate charge to mix in an additional style or colour while still combining the quantities for a larger price break. We’re pretty loose about charging this fee; mostly only when the mix demands extra logistics on our end. We have a similar $10 charge for changing the ink colour while still combining the quantity. A 100 piece order split between black tees with a white print, and white hoodies with a black print, would have a $10 charge for the additional style, and a $10 charge for the ink change, but would qualify for our 100+ piece price break. Can I try a garment before placing a full order? The absolute best way to try a garment is to purchase a blank sample. A blank sample lets you wash, wear, and truly test the garment. We don’t have any blank samples to borrow from our studio. Let your Account Executive know what you’re looking for and we can get Blank Order started for you. If a blank sample isn’t in the budget (or timeline! ), your Account Executive can help recommend the perfect garment for your needs. *Some brands are not available for blank purchase. Handling supplied blanks introduces many challenges. It’s typically the same cost when we source the garments, but the logistics of the order are way more streamlined when the garment sourcing and screen printing are done together. We can’t source everything, so we recognize that some situations require supplied garments. These guidelines will help the order process roll smoothly when supplying garments for printing. This type of order process is best suited to clients with experience ordering custom apparel. Garment quantities and descriptions must be accurate and confirmed before they are sent to Floodway. Excessive additional changes to orders before approval may be subject to additional charges. Design must be in vector format, ready to print. Raster designs must be 300dpi and to size. Garments must be sorted by design before arriving. Orders must meet minimum order quantities for all services. We cannot take on these orders if we have to sort garments, or prepare designs. It’s critical that designs and details are ready to go. Custom printing is an art form, We are experts at our craft and we do our very best to deliver, at minimum, the ordered quantity for each and every size on your order. Our overall spoilage rate is less than 1%. However, printing mistakes can and do happen. If a specific quantity is required, we advise clients to supply +3% of the total amount of garments as a spoilage buffer. For example, if exactly 100 pieces are required we recommend supplying at least 103 pieces. All of the garments we carry and supply are tested in-house to work with our processes. We cannot make this same guarantee with garments that we do not source ourselves. For these reasons, Supplied Garments carry no guarantee on print, or garment. Supplied garments do not qualify for any refunds, replacements, or credits. A huge amount of garments flow in and out of our studio daily. These guidelines will help ensure your garments are received and processed quickly and accurately. It is crucial that your Order arrives separated by design, and split by size. Your print specs must be decided and approved before we receive any garments. We require your Order to be fully Approved before receiving any items. All designs, quantities, and colour combos must be approved on your Order before receiving any items. Not providing a summary is subject to an automatic minimum sorting charge. Orders shipped unsorted or mixed up are subject to sorting fees of $75 per hour, $50 minimum per order. There is a $0.20ea charge for garments needing to be individually unwrapped. Contract Orders do not qualify for waived set-up fees at any quantity and are subject to a minimum order quantity. Contract Order quantities are based on one style garment in any variation of sizes per order. Please consult your Account Executive for custom pricing details when planning to get the same print across several different garment styles. Some garment mixes require extra considerations on press which may carry extra costs, or minimums. Orders with a single-colour print in a single location are held to a minimum of 50 pieces. Orders with multiple print colours, or multiple print locations, or both, are held to a minimum of 100 pieces. Orders with 4+ colour prints, or CMYK Process prints are held to a minimum of 150 pieces. Orders with Custom Care Labels are held to a minimum of 100 pieces. All orders are packed neatly by size, style, and design. Larger quantities are typically split into dozens. We also offer Specialty Finishing Services like folding and bagging. Do you recommend Custom Printed Care Labels inside of hoodies or pullovers? We don’t recommend Custom Printed Care Labels inside fleece items because the fuzzy interior simply doesn’t print well. Care Labels have many small, thin details that get lost in the texture of the garment. For a high-end finish on fleece items we recommend sewing in a Custom Woven Label. Ask your Account Executive for more details! Do you have templates for Custom Printed Care Labels? Sure do! We have a couple quick pre-made templates for custom care labels available free of charge! A .pdf of the templates can be viewed right here. Ask your Account Executive about placing your logo into one of the templates! Can you print more than t-shirts? Of course! Our in-house specialities include screenprinting, wholesale garment procurement, and graphic/spot-colour design. We supply and print t-shirts, tanks, baseball tees, hooded pullovers, zip-up hoodies, and more. Our Supply Division works closely with top manufacturers to connect our clients with production services to pair with our in-house specialities. We’re not your average ‘promo’ company. Our in-house production experience and wholesale relationships ensure easy communication, top quality, and the best pricing. All backed by the same quality standards as our in-house specialties. Where is the shop? Is parking available? We are tucked into Winnipeg’s historical Exchange District. Use the map and info below to find our shop, score free parking in a Loading Zone, and get assistance loading your Order. Free short-term Loading Zones for pickups are marked on the map below. The best loading zone is directly out front of 290 McDermot Avenue. There are additional Free Loading Zones on the east and west side of the block. Paid Parking is marked in red. Our team is ready and available to help bring Orders to your vehicle. Please come inside to request this assistance. Unfortunately our studio is not wheelchair accessible. The lobby has ~6 stairs leading to the elevator. We are happy to assist in any way possible. We are committed to complying with the Accessibility Standard for Customer Service under The Accessibility for Manitobans Act. Our policies, practices and measures reflect the principles of dignity, independence, integration and equal opportunity for people with disabilities. If a barrier to accessing our goods or services cannot be removed, we seek to provide alternate ways to access the goods or services. For our full Accessibility Standards, click here. Please note, we are typically unable to accommodate walk-in visitors. A couple details are required before any in-person consultation. The absolute best and fastest way to get your order started is to contact us by email. Can I stop by to chat about my order? Our shop hours vary with our workload, so our studio is open by appointment only. Shoot us an email and we’ll set up a meeting! Can I buy a ‘Take Home Screen’ with my design exposed into it? Sure can! We offer ‘Take Home Screens’ and we’re always down to help other screenprinters. We started in a basement ourselves! We supply new aluminum screen frames with high quality mesh for $45+tax. We can coat the screen with emulsion and expose with your design for +$15. This includes the transparent film positive of your design. The dimensions of the design, and the orientiation / placement of the design on the screen is confirmed during the order process. Multiple designs can be exposed on the same screen, space permitting. Ask your Account Executive for more details! We do not offer screen cleaning services for used screens at this time. Yikes! If your plans change, let your Account Executive know as soon as possible. Cancellations will not be accepted once your order has been printed. Rush Orders are not eligible for any cancellations. Any work completed on your order or associated costs at the time of cancellation cannot be refunded. Can you waive my PST / RST? Sure can! The PST / RST can be waived on orders that are for resale, or for items that are being shipped outside of Manitoba. We require a scan of your PST / RST Registration Certificate to waive the PST / RST on your order. 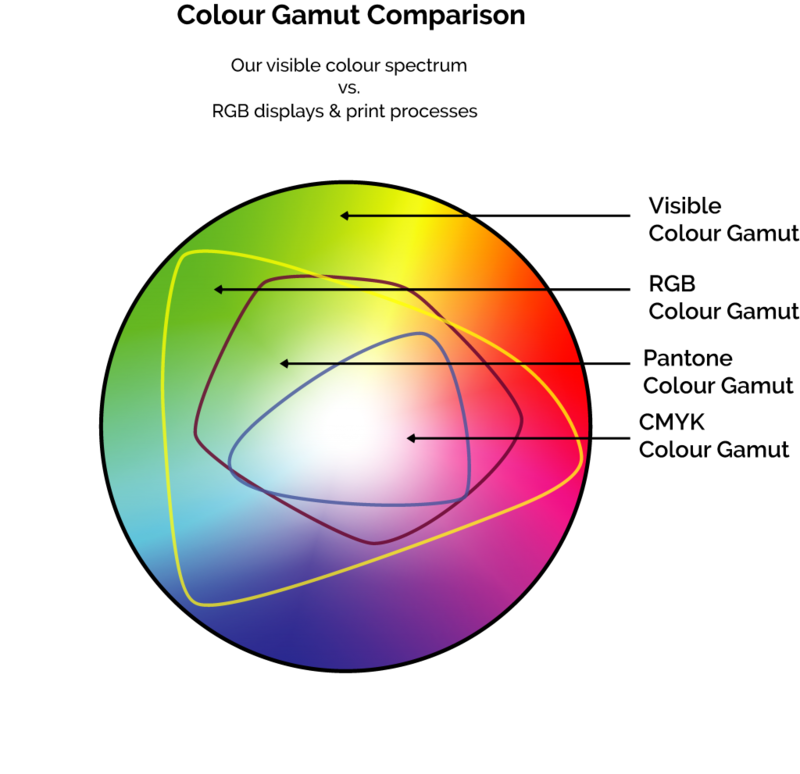 What is the difference between RGB, CMYK, Pantone, and other Colour Spectrums? Our eyes can see a wide variety of colours, but not all of those colours can be printed. There are many compromises happening with colour when our eyes are viewing colours represented on an RGB display like our phones, or a CMYK printout on a billboard, or a swatch in a Pantone Colour Guide, or a spot-colour Screen Printed on a t-shirt. Use our Colour Gamut Comparison to get an idea of the range of colours that can be seen by our eyes, versus displayed on a screen, mixed with the Pantone System, or with CMYK inks. What if I don’t have access to a Pantone Book? When a colour is critical, the best way to communicate it is with the Pantone Colour Books. The books allow you to be confident that the swatch you’re looking at in your book is the same as the swatch in your printers’ book. Pantone colours can be simulated on a computer or mobile device, but for true communication accuracy the best bet it to choose from a physical Pantone Book. Contact a local design studio and ask if you can visit to choose a colour. Visit your nearest print shop (including ours) and ask if you can have a look through their book to choose a colour. Ask any designer or artist in your social network if they may have access to a Book.